Mountain Empire's Dallas Prince (left) and Esteban Castillo. Friday night, the No. 3 ranked team in Division V traveled to RedHawk Stadium to take on the battle-tested Redhawks. The H-Team jumped out to a 7-0 lead and seemed to be controlling the game by running the ball and chewing up the clock but could not translate that into more points on the board. Late in the second half, Gabe Hydorn threw a 15-yard TD pass to Marquis Davis and the RedHawks went into the half tied 7-7. In the third quarter, after another time-consuming drive, The H-team was stopped on the ME 15-yard line and attempted a field goal. A fake turned into a disaster as Dallas Prince forced a fumble and Marcus Smith scooped it and raced down the sideline for a RedHawks 14-7 lead. For more than three quarters, Mountain Empire (5-3 overall, 1-0 league) continued to step up in key situations. Included were a pair of stops in the red zone, then an interception. The rest of the third and fourth quarter was hard fought and neither team put points on the board. 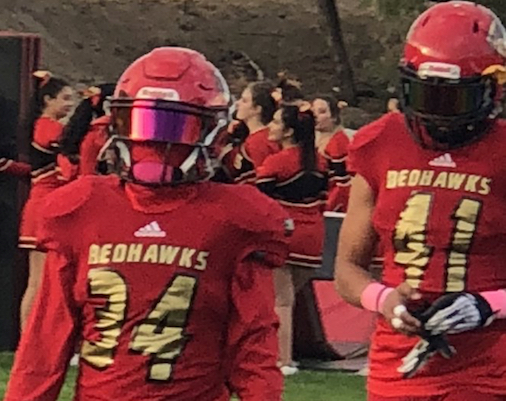 Holtville answered back in the fourth quarter and the contest seems destined for overtime – until the RedHawks’ offense finally came to the forefront. The Vikings (5-2, 0-1) later missed on a fourth-down opportunity, meaning the RedHawks needed to drive more than 70 yards for the winning score in the final minutes. The RedHawks took the ball over on their own 10-yard line with two minutes to go and out timeout remaining. After gaining a first down, ME managed to make their way to their own 30. After three unsuccessful downs, the RedHawks were facing fourth down. At that moment, what has overnight been dubbed “The Drive” happened. With 40 seconds on the clock, Hydorn dropped back and completed a 40-yard pass to Prince just outside the left hash. A time-out was called. The next play, with 29 seconds left, Hydorn threw a skinny post to Smith that resulted in an incompletion. Then, with 25 seconds left, Smith, a sophomore, came up with the biggest play of the season, a 30-yard TD reception from Hydorn and a Mountain Empire victory on Homecoming in their first League game of the season in the battle of preseason favorites in the Manzanita League. The win gives RedHawks the inside track to the league championship. Next week the RedHawks travel to Calipatria for a league matchup.